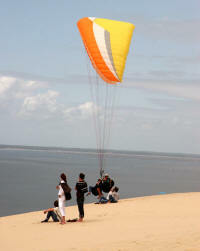 With generally more reliable weather why not combine your Paragliding training with a holiday in the sun? Due to demand we can now only offer holidays to existing Airsports students. 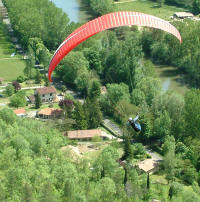 France in the summer offers some of the best all-round Paragliding in the world. Beautiful scenery, nice grass take offs with large landing fields. Paragliding started here and the French have never looked back. More dedicated flying sites than any other country along with generally good weather also plenty of alternative things to do such as Biking, surfing, rafting, climbing, lazing around etc. One week with five days tuition and favourable weather could see you reach Club Pilot standard. You could be flying from 2700' and thermaling by the end of the week. Shared accommodation, transport to the site, tuition and breakfast is all included. Shared bed and breakfast accommodation is set in 1 acre with stunning views to the Pyrenees mountains. We have found B & B the best option and we normally eat out after a days flying or maybe a BBQ. Spain can offer good winter flying, the terrain is less forgiving than France and maybe not so picturesque but the weather conditions can be good for Elementary to Club Pilot training in November and February. We run courses in south and north Spain depending on the time of year. Please contact the office for full details and availability. All our holidays are subject to terms and conditions.